We’ve been growing hydroponic leafy greens in the Sub-Arctic for over a year now. Whether its 50 below or 38 above, we’ve kept our roughly 3000 plants alive and are proving that this is something that communities like ours CAN do. We’ve cleverly named our produce Rocket Greens to pay homage to the CNSC’s past history as a Research Rocket Launching Facility. We’ve established a weekly produce subscription service called The Launch Box (see what we did there?) that allows around 60% of what we grow to be distributed directly into Churchill households. We have been connecting with folks from all over Canada and the world using our YouTube Channel, Social Media platforms, traditional media stories and straight up word of mouth to all our many clients and visiting tourists. All thes e things I just mentioned along with the way we have embraced a relatively innovative concept and made it work here, make me extremely proud. 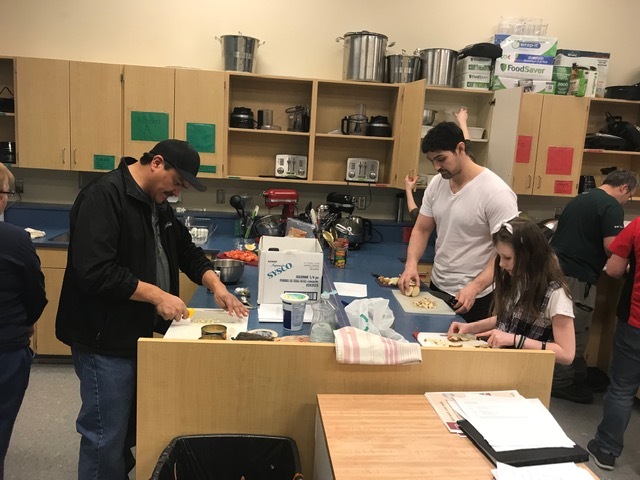 Having said this, the recent Community Cooking Event that was hosted by the CNSC in partnership with the WRHA Dietician and Churchill Public Health Nurse was a huge highlight of the project for me so far. 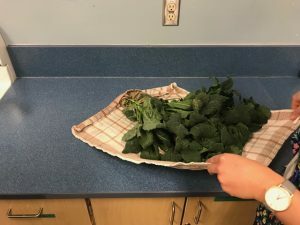 On Tuesday, March 19th a group of local Churchill folks, including a few kids, gathered in the HomeEc room at the Duke of Marlborough School in Churchill to prepare a healthy meal together using Rocket Greens harvested earlier that day from the CNSC hydroponic unit. The Churchill folks were joined by a group who were visiting the CNSC to learn more about operating hydroponics from Norway House, Roseau River, Pukatawagan, Wasagamack and Winnipeg. The 17 of us chatted about food security, plant- based proteins and the new Canada Food Guide, while we washed and chopped veggies and got the soup on to boil. 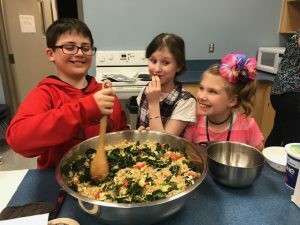 Mediterranean Kale Salad, Leafy Dijon Salad, and a hearty White Bean and Kale Soup were prepared for the entire group in a little over an hour. It was great to observe everyone talking about food issues from their own communities – everything from where the hunting was good to how to substitute items in recipes for other items when they aren’t available in your Northern Store. Manitoban’s aren’t much different no matter which part of the province you are from! Food Security/Food Sovereignty is a deep issue. Not only is food essential to life, it is also strongly rooted in culture, emotions, education and tied directly to the environment in which you live. While we may not be able to directly address all the different pieces with the Rocket Greens project, it seemed only natural to harvest these plants and share them with this group. I can’t wait until we do it again – there is nothing better to me than sharing a healthy meal and good conversation with a great group of people.